Published Jun 7, 2017 By Julia 36 CommentsThis post may contain affiliate links. This easy vegetarian potato curry has a delicious orange sauce similar to an Indian tikka masala sauce. 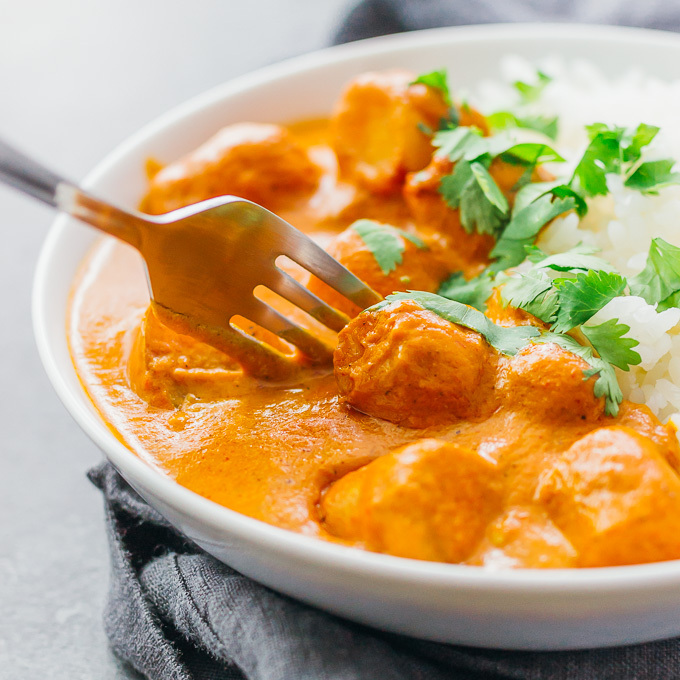 This easy weeknight potato curry is for all of the chicken tikka masala lovers out there who want an easier vegetarian version that doesn’t involve chickpeas. 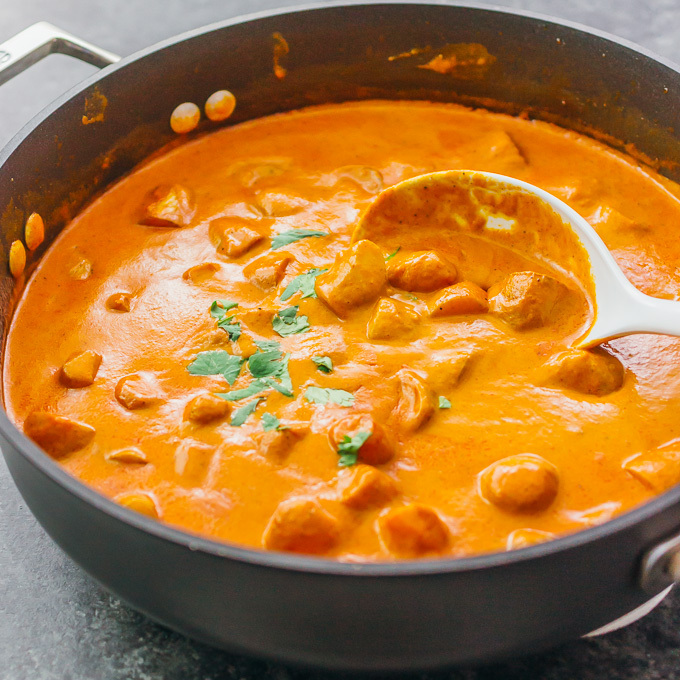 The sauce is very similar to an Indian tikka masala curry sauce, which is mainly made of tomato puree, heavy cream, and a variety of spices such as garam masala, turmeric, and paprika. The main ingredient here is potato, and I used fingerling potatoes with skins on, which are tiny stubby finger-shaped potatoes. These potatoes are pan-seared before simmering in tikka masala sauce until flavorful and very tender. These delicious potatoes coupled with amazing curry sauce over a bed of rice is crazy good, and you’ll be licking every last bit of that sauce off your plate. One-pot dish: All of the ingredients cook in a single pot/pan. Cleanup is going to be easy. Only three steps stand between you and a homemade potato curry. The recipe’s three steps are sauteing the potatoes, simmering the sauce, and serving with rice. There isn’t anything complicated. There is hardly any prep work involved in this recipe — just chopping the potatoes. You’ll be able to have this dish prepped and cooked in about thirty minutes. I like to pair this potato curry with basmati rice or homemade naan, but it’s not required. 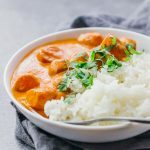 Similar to my chicken tikka masala recipes, this curry yields a generous serving of sauce, so there’s more than enough for you to soak up with rice or flatbread, but it’s so good that you can eat the sauce by itself. Heat canola oil in a 3 quart or larger pan. Add fingerling potatoes, sauteing until they are crisping around the edges, about 10 minutes, stirring occasionally. Add garlic to the pan and cook until it browns, about 1 minute. Add all remaining sauce ingredients, stirring to mix. Bring to a simmer. Cover with a lid and decrease the heat to medium-low. Cook until the potatoes are tender, about 15 minutes. Uncover the pan and stir. Serve hot with basmati rice or naan. Garnish with cilantro. Mmmmm! I used a can of whole fat coconut milk instead of heavy cream for a dairy-free alternative and added 2 tsp. curry powder in addition to the garam marsala spice as well as a few more cloves of garlic and a few leaves of Kafir lime. Delectable! Thank you for a delicious weeknight meal! Wow! So freakin good! I gave the potatoes a good frying and used a Garam Masala spice from an African shop. It was over the top. Thank you for this recipe. 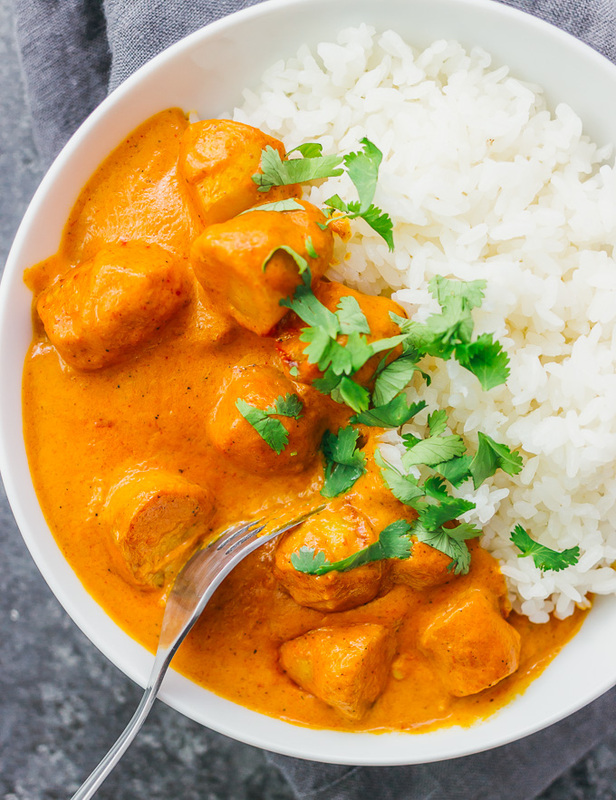 This dish is delicious, easy to make and great taste..I added more spice and cream and it’s to die for…Thanks..
That’s great to hear, Aleisha. Hoep you get a chance to make it again soon! Can this be done in the instantpot? If so, would you happen to know the timing? Such a good recipe. Like a few other people mentioned I too substituted the cream for coconut milk, doubled the spice quantities and added sweet potato and peas. It’s a bit sweeter than im used to in a curry but not in a bad way. Will definitely be adding this to my meal rotation. Fantastic, thanks for sharing your feedback! I’m glad you enjoyed the dish and was able to make some suitable substitutions. Hope you’re able to make it again soon! It was great! Really enjoyed it. Easy to make and budget friendly. Hey I was just wondering if I can substitute the tomato purée for tomato paste? No, you’ll need the tomato puree for this recipe. Can I puree my canned stewed tomatoes? That should work. Hope it comes out well! Really great starting point recipe, and really easy/quick to put together. I swapped out the heavy cream in favor of unsweetened coconut milk, and increased the cayenne just a smidge. Delicious flavor, especially the next day. I wasn’t crazy for the potato texture/flavor, so next time I’ll probably sub in tofu instead. Get yourself some naan bread as a side, and this will definitely become your new favorite meal. I have made this more times that I can count. It is SO good. I usually add in more of the spices then recommended. My wife isn’t a big fan of it because she doesn’t like “red sauce”, but oh well, I just make a batch of it and eat it for lunch all week. Definetly recommend making this recipe. I didnt see you add the lemon juice in the video which is listed as an ingredient. Not needed or just not shown? It was not shown in the video, but I do recommend adding lemon juice. Let me know if you have any other questions! Very Good!Doubled the recipe, substituted coconut milk for heavy cream, and a dash of red chili flakes instead of cayenne. I added frozen peas at the end as another reader had suggested. Loved it!! It’s delicious but I must have missed something mine is also too “tomato” tasting. tomato pure is too much in the recepie. i added only 3 tbsp of it the second time i made it. also i replace potatoes with chicken brests bites for my non vegetarian boyfriend. it turned out great. This was pretty good, although it was a bit too “tomato-y” for me. Is there a way to decrease the amount of tomato sauce? I would keep the amount of tomato sauce the same, and increase the heavy cream and spices a bit to see if that helps. I’m surprised to hear that you thought it was too tomato-y though, myself and others have made this numerous times and it never tasted like tomato. Just made this and it was INCREDIBLE! I substituted coconut milk instead of the heavy whipping cream to make it vegan and it was great. I love how simple it is to make and the clean up was a breeze! You think i could add frozen peas to this? I am making this tonight. If you don’t answer i will just add it and let you know how it came out. Hi Charles, I just saw your comment! Peas would be a great addition, and I think you can just stir in frozen peas at the end of the recipe. I did about half a cup it was great. Made this for dinner and switched out the cream for coconut milk also added a bit of cauliflower and pumpkin. Then after lightly cooking in the pan I transferred it to my slow cooker to finish off. Am also in the middle of making your naan bread (making the dough in my bread maker) and really looking forward to eating it all up. Have you ever switched the heavy cream for coconut milk? This sounds delicious, but my husband doesn’t eat dairy. I made this for dinner tonight and it was delicious. It is so simple and easy but full of flavor. I wanted to lick the pan clean! This will be a repeat. Thank you!